Predicting the weather is tricky. Even high-tech forecasting technology sometimes fails to spot impending rain, snow, or calm. 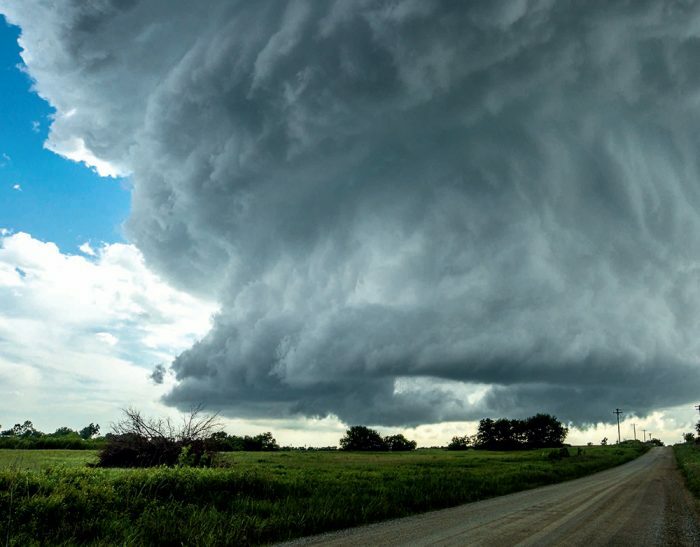 But nature provides some signals that weather events are on the way, and many low-tech storm chasers make hobbies and careers out of reading those signs. 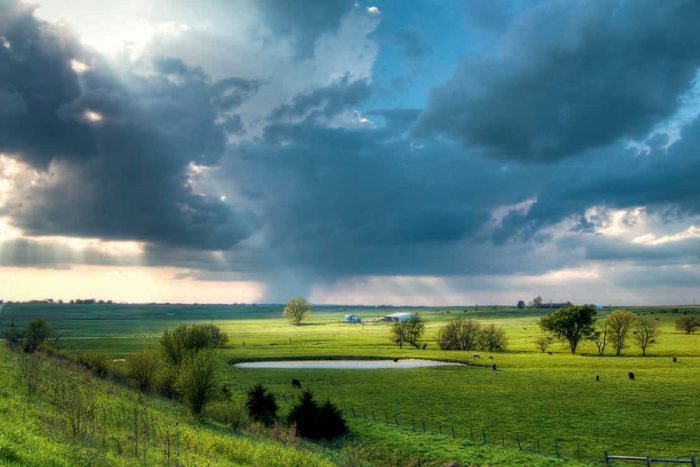 We caught up with one such chaser, Michael Sachweh, author of “Stormchasing: On the Hunt for Thunderstorms.” We asked for some basic clues anyone could spot that warn of inclement weather on the horizon. Below are five cloud conditions you can watch for before a storm breaks. 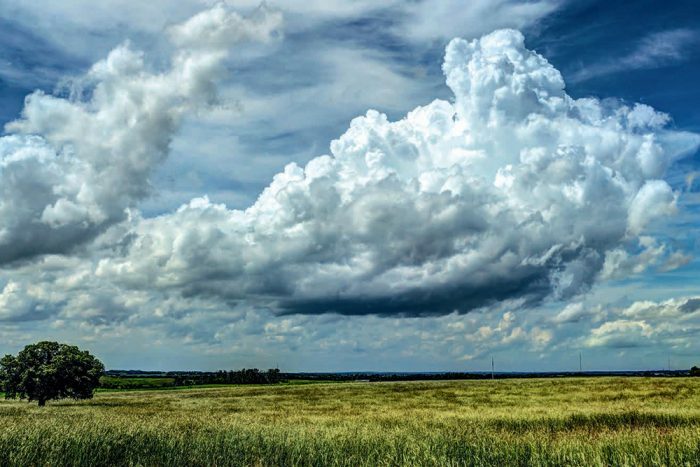 Cumulus clouds take shape in Erick, Okla.
Cumulus clouds are often seen as fluffy, fair-weather cotton balls in the sky. But there are some nasty-weather cousins to these puffy clouds. Watch for vertical development, clouds that billow upward, as a storm can follow. If the atmospheric conditions are favorable, a towering cumulus cloud like this can develop into a powerful thunderstorm within an hour. Many violent summer thunderstorms originate at the foot of the Alps and Rockies and intensify as they travel over the flat Alpine foreland. 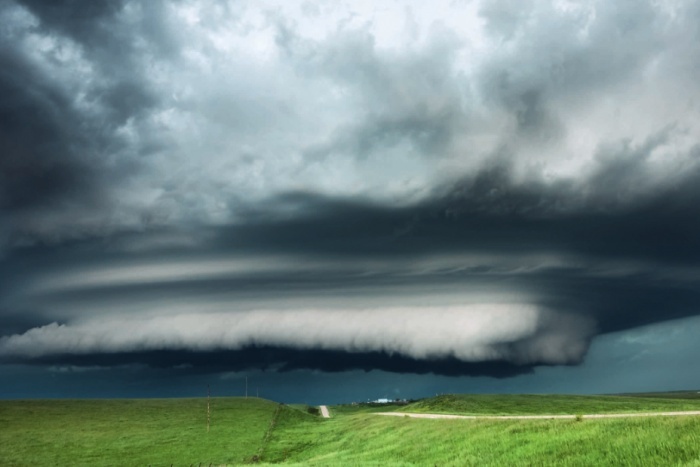 In this photo, an “arcus” cloud signals foul weather. 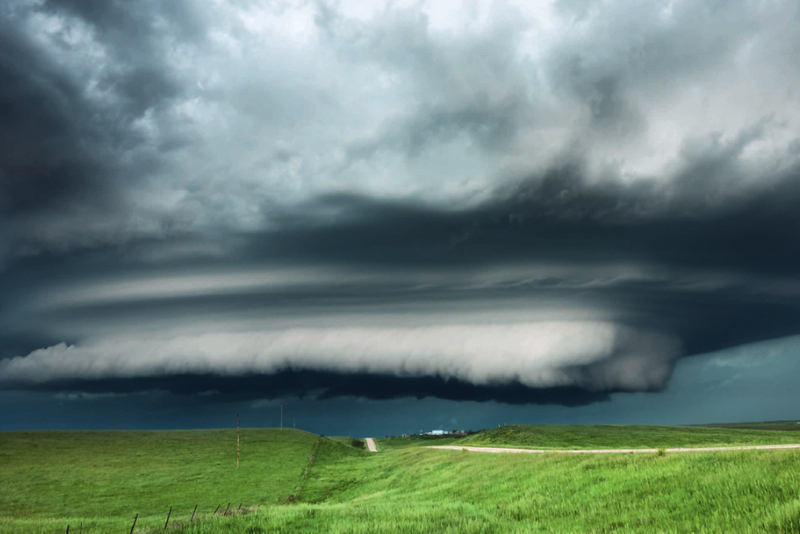 Also known as “shelf” clouds, these wedge-shaped clouds are attached to parent clouds, resulting in a thunderstorm. The cloud cover of an oncoming storm already envelops over a hayfield in the photo above. 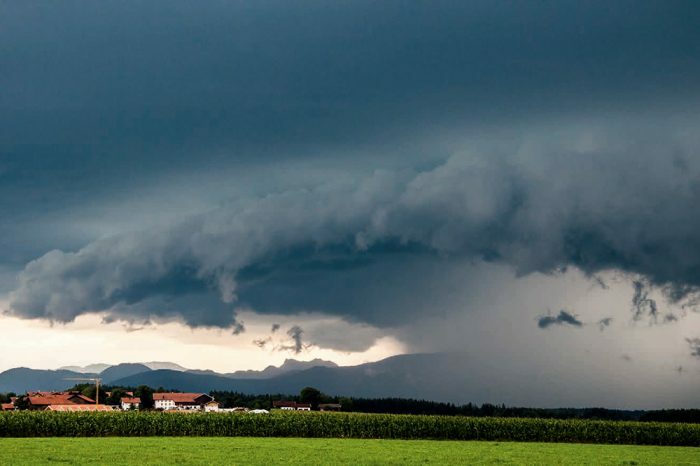 It does not take long until the torrential rain and severe gusts start, because the characteristic lowered cloud base with the threatening bluish-black underside (wall cloud) loom in the distance behind the mountain range. Green clouds in particular typically point to severe weather. For clouds to appear green, they must be very deep (tall). Typically, as noted above, those tall clouds occur in thunderstorms. A deceptively menacing weather pattern in Iola, Kans. At first glance of this scene looks peaceful, with shafts of sunlight trickling through gaps in the clouds. But the atmosphere is sizzling. A large number of smaller cumulus clouds in the foreground are beginning to build upward and are unusually dark. Why? Because they are in the shadow of a large and high-altitude cumulus “congestus” cloud (“towering cumulus”). The huge cauliflower-like top stretches vertically behind the ragged, dark clouds in the foreground. 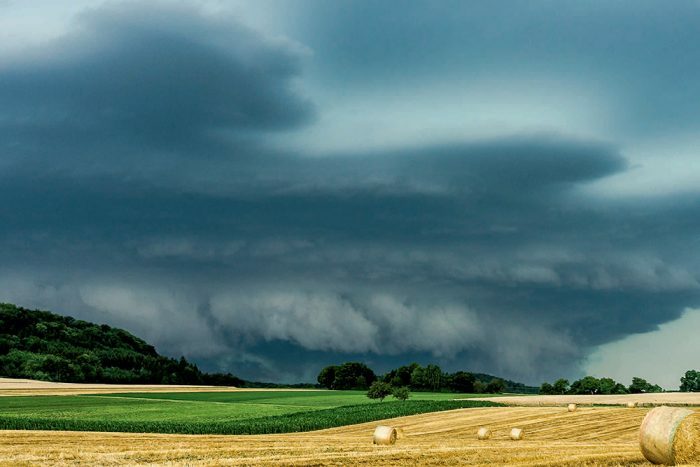 A rotating wall cloud with a lowered cloud base is characteristic of a severe thunderstorm (supercell). This is a very impressive example of such a wall cloud. It’s the most obvious sign of a severe storm: twisting, rotating, and unusually quick-moving clouds. Stormchasing: On the Hunt for Thunderstorms by Michael Sachweh, published by Delius Klasing, is available now at bookstores and on Amazon.